I normally don't feature Ferraris. 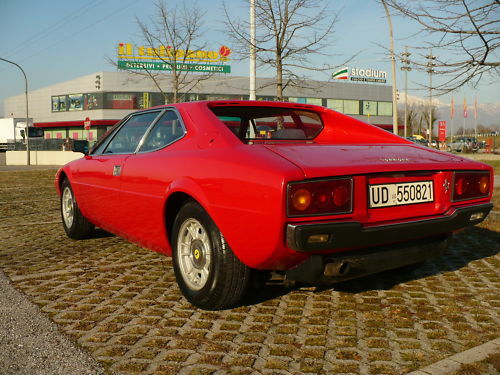 It's not that I don't like them - quite the contrary, I like them a lot - I just figure that since there are so many really good sites dedicated to Italian exotics, I'd leave the Ferraris to them. Anyway, this blog is about affordable old cars. This one however, is too cool to pass on. 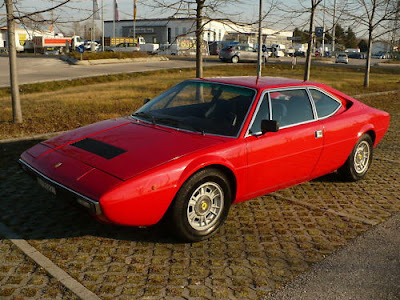 This Ferrari is a Dino 208 GT4. The 208 GT4 is based on the 308 GT4. The 308 GT4 was the first Ferrari production car to be designed by Bertone. 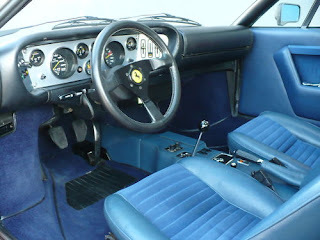 It was also the first to feature a mid-mounted V8. In Italy cars with engines over 2 liters are taxed at a much higher rate than those at 2 liters and under. The 208 GT4 was a Ferrari for the home market and has a 2.0 liter V8. That's the smallest V8 ever produced. Even though it is small, the 2.0 V8 puts out 170 HP and gave the 208 a top speed of over 135 MPH. These are not extremely popular and that makes it one of the most affordable Ferraris you can buy. It's not especially fast, but it is somewhat rare. Just remember that the purchase price for this car, or any Ferrari, is just the beginning. These are high maintenance cars and parts are extremely expensive. Located in Pordenone, PN, Italy, click here to see the eBay listing. Note that the 2.0 litre is Ferrari's smallest production V8. 1.5 litre F.1 engines were made with Vee and flat architecture. Others have made V8s as small as 500cc. I'd like to see that engine in a motorcycle. Or my 2-liter Alfa. Damn that's a beautiful car. Unfortunately the two litre Ferrari V8 is exactly the same external dimension as the three litre we got for USA. It ain't small....The upside if you buy the car is the big engine is a bolt in swap. This thing is ripe for a Fiero drivetrain swap. Quad Four, baby! I've always liked these cars, especially with meatier rolling stock. I figure it's the only Ferrari I could ever afford... and I like the oddballs. But, while I could buy one, I don't think I could afford to maintain it.